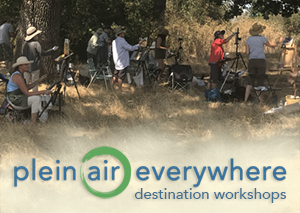 The well-known Californian plein air painter Bryan Mark Taylor has been working on a new kind of outdoor easel for the past two years. When he shared an early prototype with me back in 2011 he said his intention was to create something that would be bomb-proof. That caught my attention because I’d just had a French easel collapse on me in the field during a competition. Bryan has been hard at work since then, sharing a few developmental steps along the way, and now his easel is in production and available for purchase. He calls his easel the “Strada”. It is aptly named because in Italian strada means “road or passage way”, and Bryan’s goal was to invent a new way to paint en plein air. 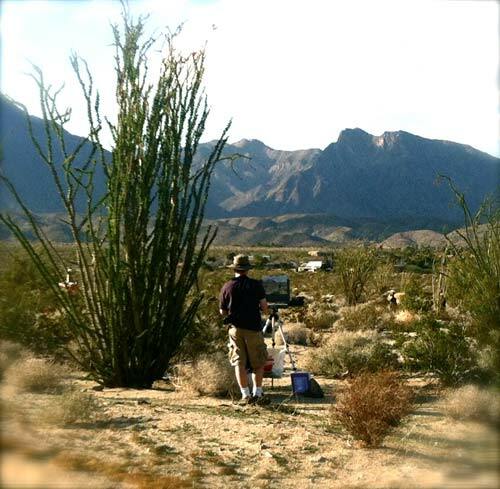 Bryan is a professional plein air artist himself so he is intimate with the highs and lows of painting outdoors. At a competitive plein air event he may set up and tear down his easel five or six times a day. So to him, ease of use is a high priority. Last month Bryan called to tell me the Strada was shipping I said “Great, when could I see one?” He told me one was already on the way and asked if I would give it a try and post a review. Since I am always interested in painting gear I agreed. Disclaimer: Bryan and I are painting friends. While I am happy to talk about the Strada I want to state I have no connection to the easel. (Aside from being offered one to try out.) I have been using with the Strada for almost four weeks now and believe I can discuss the pros and cons of it in a fair and objective way. No single easel design is perfect for every situation – so having a new option for outdoor painters is a boon. And yes, the Strada offers a unique and interesting spin to the pochade category. The Strada is made entirely out of aluminum and this permits it to be trim and functional and impervious to effects of humidity and moisture; two things which can trouble any wooden easel. The Strada’s shell and weld-joints appear quite solid and the entire surface is coated with a pleasant medium value gray. It feels like you could drop it without deforming the shape so I believe the Strada could survive multiple blow-downs in the field. But honestly, I didn’t actually push it over to find out. Besides the pachode box itself, the Strada comes with a interior plexiglass mixing area and a S-hook you can use to hang a can of solvent on. You can also purchase one or two side shelves to lay your painting gear out on, or to provide additional mixing area in a pinch. Bryan is keeping the price for a shelf modest. Bryan’s primary objective was to make setting up and tearing down up as quick and easy as possible and he succeeds at it. The defining characteristic of any clamshell design is it opens up like – well, a clam – and until now, all the easels in this category use a combination of hinges, slotted sliding bars, and knobs to fix the painting support open. The Strada cleverly reduces the hardware down to two friction hinges that hold the painting support open. So there is nothing to slide, adjust, or tighten down once you open the lid. You simply pull out the latch, flip open the lid, insert a canvas, and start pushing the paint around. It can’t get more quick than that. It works like a laptop. The lid, which supports your canvas, has a full 180º range of movement so you can set it at any angle you like. When you are done with your painting you pull it off and close the lid. Then, you stuff the Strada into a backpack or roller bag with the rest of your gear and move on. If you pair the Strada with a professional-grade tripod and quick release plate the combination is almost as stable as any high-end pochade design I’ve used. Almost. There is a little wiggle you'll have to live with if you like the convenience of the easy open hinges. The friction hinges on the Strada are spec’ed to a 20,000x life cycle and Bryan tells me he will replace them without cost if they should prematurely fail. In other words, if you open and close your Strada five times a day, every day of the year, the hinges are rated to last almost eleven years. There are some design nigglies to be aware of. The primary one has to do with what kind of support you like to paint on. The Strada canvas/panel support rails accepts 3/4 or 1 inch stretcher bars and panels that range from 1/8 to 3/8 in thickness. You can insert a thinner panel – say one of the Raymar Featherlites™ – but if you do you’ll need to double up the panels to fill the gap. Bryan tells me the easel is now shipping with a couple of #8/32 locking nuts which can be used to reduce the gap on the pins and thus will hold a standard panel more firmly. I didn’t have them for my testing but will stop by a hardware store and pick some up this weekend. UPDATE: A second generation design revision to the Strada offers a shallow bottom rail and it holds a standard plein air painting panel without impeding your brush. Plus, the addition of a small clip at to the top of the T-bar holds a panel tightly along the top edge without casting any shadow across your painting. The second generation Stradas now ship with both improvements and I find they work well in the field. The Strada’s painting support holds a canvas or panel along the top and bottom using a sliding t-bar and friction based compression. When my easel arrived there wasn’t enough resistance in the slot to grip a panel tightly so Bryan told me to bend the T-bar slightly to increase the friction. This fixed the issue. (Bryan also tells me the easels are now being shipped with the T-bar pre-bent.) The lower rail can be raised to accommodate a tiny painting or to lift a larger one away from the mixing area. Both the upper and lower rails have integrated pins to hold a panel in place, and if you prefer to paint on stretched canvas there are lips which hold it against the back as well. Unfortunately, the bottom lip can interfere with painting along the lower edge of a panel so I may grind it off. I rarely paint on stretched canvas anyway. A nice touch would be for Bryan to offer an second lower rail without the lip. Then the rails could be swapped out as needed. UPDATE: Due to a manufacturing change it is no longer necessary to bend the T-Bar. Bryan has reduced every elements of the Strada down to its simplest form possible and many elements serve multiple functions. For example, the sliding T-bar not only works as a latch to hold the easel shut it also serves as the top rail to hold your painting while you work. And when the easel is closed the top and bottom rails hold the plexiglass palette in place as you carry it around. So packing up and moving to a new location is easy. Just shut the lid and go. As a bonus, the Strada can be placed on your thighs like a laptop, or set on a flat surface without a tripod. Definitely a bonus for anyone who wants to travel without a bulky tripod. Fancy bells and whistles are very nice but the primary duty of an easel is to hold a painting steady at a comfortable height. While there is no limit to how wide a canvas the Strada will hold (theoretically) there is a practical limit to the height it can hold, and it runs a little beyond 16 inches or so. You can insert a taller canvas or panel if you wish but the compression of the top rail will begin to loosen and you may experience some rocking as you paint. I don’t view the 16 inches as a limit specific to the Strada because every pochade box of this size I’ve used has a similar height or width restriction and anyone who wants to paint larger in the field should immediately skip to the French or Gloucester easel. Bottom line: if you don't paint more than 16 inches vertically in the field the Strada is an option to consider. My one serious complaint has to do with the top rail. I often paint in direct sunlight without an umbrella. So the top rail can cast a shadow across your painting if the angle is right. This won't be an issue for those who prefer to paint on a canvas, but since I don’t I’ll likely grind off the offending projection and reserve the Strada for panels only. UPDATE: Since the second generation Stradas now ship with a new bottom panel rail there is no ledge to interfere with you painting along the edge. After retro-fitting mine, I have no need or desire to grind the original rail at all. Upgrading is easy. You just swap out the old rail for the new one and I have kept the old rail in case I ever go back to painting on a small canvas because it can accommodate a 3/4 to one inch stretcher bar. 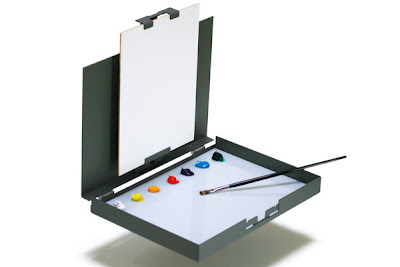 Every pochade box design has one advantage over the French and Gloucester easels, and it is the convenience of mixing your colors directly underneath your painting. That is one of the reasons I prefer them in general. I dislike bending over a palette at my waist, or constantly nodding up and down as I work. It turns out my spine doesn’t like it either. So if your back has been troubling you consider switching to a pochade box design. Any model will alleviate the pain. Due to it’s efficient design, the Strada’s mixing area is 14 x 16 inches. But if you are used to placing your piles of paint along the top edge of your palette you’ll need to readjust to laying them down along the sides. Otherwise you may gum up the hinges in short order. This doesn’t strike me as much of a concern and I expect to quickly readjust. The Strada ships with a white plexiglass sheet to mix on. The expectation is that you will leave it in the lower pan. You might like mixing on plexiglass, but I don’t like doing so. It scratches easily. So I’ll either replace it with custom cut piece of tempered glass caulked into place or simply pull the plexiglass out and mix directly on the bottom of the pan. (I’ll probably go with the glass since I prefer to use a razor blade to scrape areas clean as I work.) If I decide to mix directly on the bottom of the pan there will be a few protrusions to contend with – one being the threaded tripod mount in the center – but if you’ve ever seen one of my other palettes you’ll understand that bumps and knots of dried paint don’t concern me. What you decide to do about Strada’s mixing area will be up to you. As I mentioned at the outset, there are basically three kinds of plein air easels, with some version being well thought out and built to solid specs – and others rickety pieces of crap aimed at the unsuspecting newbie. In my experience the best solutions focus on simplicity and durability. The Strada is the first spin on the clamshell pochade box design I’ve seen in a while that offers something new. The friction hinges are a real convenience and the substantial aluminum construction is another. The Strada may not appeal to the most romantic of souls – the plein air painter who weeps for being born a century too late – but it should appeal to the practical outdoor artist who wants a no-nonsense bomb-proof solution. This easel was designed and brought to market by a seasoned pro and I believe it has a great future. The Strada will be the easel I take when I want to travel fast and light and plan to paint at small sizes. It will be good to have on a backcountry trek, or when I expect my gear to take a beating from a pack mules or a rough stretch of whitewater. Or from those ubiquitous TSA luggage monkeys who like to play a game of ring-toss with my duffle bags after the airplane lands. Pros: Fast and simple to set up and tear down. A trim form that provides a generous mixing area for the size. Solid build quality. Feels good to use. When closed, reduces air flow into the mixing area, which is good because it slows the drying of paint left on the palette. Ideal for rough travel. Cons: Somewhat finicky with thin or large panel supports larger than 16 inches high. Some wiggle. Plexiglass mixing area. Top rail can cast a distracting shadow in direct sunlight. Lower rail can interfere with brushwork along bottom edge. UPDATE: Again, the second generation Strada has done away with my concern about using panel supports. The new design (and the retro-fit parts available for the first generation) now holds a medium sized panel securely and does not interfere with edges in a significant way. With regards to my original concerns about mixing on a plexiglass surface, I have found that doing so hasn't turned out to be a problem after all. While I might prefer to mix on glass and use a metal razor blade to quickly clear away areas for fresh color, I've also found that wiping the Strada palette clean while I paint is not an issue either. And it is nice to not worry about breakage when slamming your gear around. As it turns out, if you are worried about scratching the Strada palette Amazon sells plastic 'razor' blades in 100 count packs for about $9.00. (About nine cents each.) While I haven't used them myself I plan to order a pack the next time I make a purchase on Amazon to see if they do actually perform better than a palette knife. But I suspect they won't and will likely stick to loading as few tools in my kit as possible. In any case, I have found that mixing and cleaning on the Strada plexiglass palette not to be an issue. Certainly not a deal-breaker for me. Please let me know if you feel otherwise. If you own a first generation Strada and like to paint on panels then you should contact Bryan Mark Taylor to get his new bottom rail and top clip and switch out the ones you have. They really are a vast improvement. For those looking to buy a new Strada, his second generation easels are now manufactured with his improved panel system in place. Bryan's drive to produce ongoing innovative and functional improvements are a testiment to his desire to make the best clamshell easel ever. Within one year all of my concerns were addressed in an elegant and simple way and I can now enthusiastically endorse the Strada (and Bryan's new Strada mini) as excellent options for the outdoor painter! I got a glimpse of this at the Convention last year and was very curious what it was all about. Thanks for the review. Since weight is an issue considering all the other equipment necessary to paint, i wonder how much it weighs? The easel weighs 4lbs 3 oz. Brenda: So the Strada weighs in close to a similar sized easel. I have a 11 x 14 Open Box M with a glass mixing area I caulked in. They feel equivalent to me. Thanks for your review, I bought to try out in italy this summer. 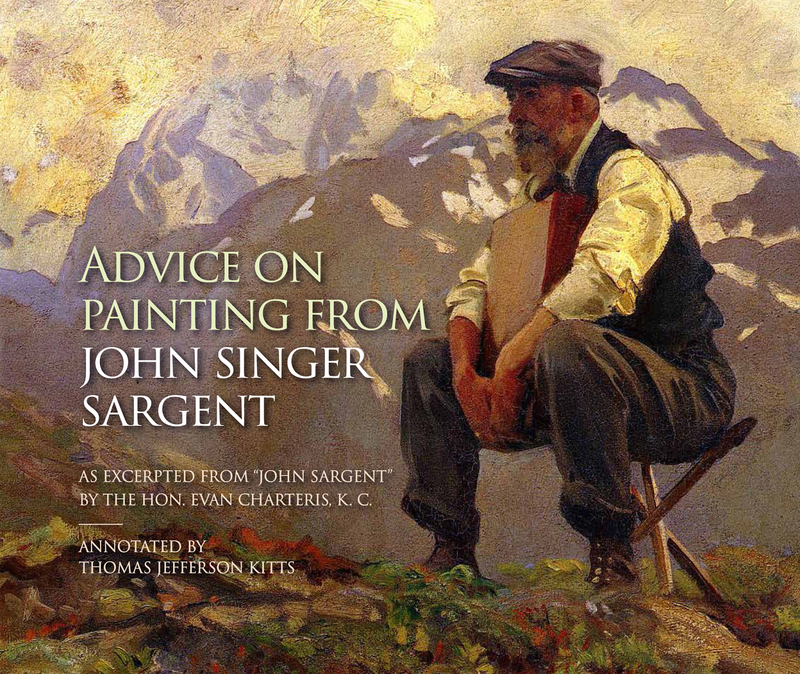 i'm not a landscape painter so your insight is super valuable! I've been thinking about getting one of these. I still haven't made up mind, but this review is quite helpful. thanks! Annie, I should add that Bryan has addressed one of the few reservations I had with his easel after this review -- which has to do with how the top t-bar holds a panel. Bryan now ships his easels with a nifty little clip, which if attached to the t-bar after it is flipped around, prevents any shadow being cast across your painting. So I believe the Strada is a good choice for the plein air painter and soon to become a classic in the field. I'm looking into buying either the Strada or the Open Box M, so I really appreciated your thorough review! At this point in time, which of the two easels do you find yourself gravitating towards more often? I plan to paint in some more remote locations, so durability, stability, and weight are my biggest considerations. Have you had any parts on your Open Box M give out? (And if so, were they easily fixable?) It seems to me that the main benefit of the Strada is the lack of wingnuts to adjust, possibly its durability, etc...and I know that I'd rather adjust a few wingnuts than have a painting wobble when I'm laying down more forceful brushstrokes. Again, thank you for this great review. It's a big help! And it's a joy to have so many great options to choose from. Well, as I said in the review I believe both the Open Box M and the Strada easels are excellent choices. For me, the easel I take depends the size I plan to work at. I have two Open Box Ms, the middle and largest size. I tend to use the larger OBM most of all because I have been working larger in the field as of late and I like the increased mixing area. The larger OBM can hold a 24 x 18 panel vertically if it isn't windy but its horizontal limit is around 25 or 27 inches. And while I have broken one OBM in the field (my smaller one) it withstood almost five years of hard use for me to do so and I still got it to work until Doug (the manufacturer) was able to send me replacement parts, which I fixed myself. And Doug got those parts out the door quickly. But if you plan to paint on canvases or panels no larger than say, 16 inches vertically, and you want an absolutely bomb-proof system then the all aluminum Strada is something to consider. There is no horizontal limitation to the Strada -- meaning, you could hang a 30 inch or wider canvas, which beats the largest OBM's capability. There are fewer parts on the Strada to break so theoretically that is a strong point and it can easily be used as a table top (it has a perfectly flat bottom) or as a lap easel when you are traveling light without tripod. I've used it that way and it works well. I'm sorry I can't be more decisive than that but then I do have a total of 5 different kinds of easels. Give some thought as to how you will use your new easel, the size you expect to paint at, the way you will transport it, and that should steer to the solution that will be best for you. And BTW, most of the wobble in these easel come from the tripod head and quick-release plates, not the easel itself. I expected the Strada friction hinges to add some wobble to the canvas/panel but my (unscientific) tests didn't support that concern. Both designs seemed comparable in that regard. If wind is a concern then you should look at the Take-It Glouchester Easel. It's big but built for handling wind. I'll be taking it to Maui in February. Last year I had many blow downs in 45 mph gusts with my tripod system. But I won't with the Take-It easel. The Take-It easel needs a post so perhaps I'll get to that soon. Have you reviewed the Art Box and Panel, or compared it with the Open Box M? Thank you! had an aluminum version which I bought two years ago that also seemed more stable. It certainly was a clever solution using aluminum moulding. But I can't find it on his site anymore. However, in the end I decided that after accounting for the tripod, the mixing palette, and the stick easel itself, all the parts took up about the same room as my Open Box M does in a backpack. And I find the OB M to be one of the most stable bomb-proof systems out there. Do you find you tend to rest your hand on the set up when painting with the OpenBoxM? Also, wouldn't you be looking up and down when using the Coulter system...from palette to painting much more? Just curious. Anonymous, in the photo I have shown myself using the Strada with the palette parallel to the ground. In truth I generally tip it and the palette of the Open Box M almost vertical so the light that hits the easel is the same that hits the painting. Makes it easier to mix my color that way. And it gets the palette out of the way as I work. If I need to apply a finicky detail I will brace me hand by grabbing on to the easel, but only until I have made that touch. Then I step back and continue painting from a distance. I am a newbie to plein air, trying to decide about equipment. I like the OBM, the largest one for mixing, but don't like the fact you cannot take it off the tripod and use it conveniently on a table..also wonder which easel system is best if you like to sit (at times) when you paint? Any comments suggestions appreciated.. Anonymous, measure the depth of the piece of plywood on the bottom of the Open Box M the easel mount is set into. (I think it is nominally 3/4 of an inch.) Now, either epoxy a couple of same sized pieces of plywood out in the corners of the box or screw on a couple of rubber door stops for little legs. Voila! Now you have a table easel. One caveat: if you set the easel on the table and open the top part past the vertical the whole thing can tip over backwards in the wind. A small c-clamp and the edge of the table would address this issue. With the BMT Strada you don't need to do any of that. It has a flat bottom already. But there still is a tipping hazard. Okay, I was being lazy whenI responded and only now just got up to look at my larger OBM. The plywood support is closer to 1/2 inch deep and the corner screw pins are deeper. So measure those instead and use that as your leg size. Thank you very much. I was thinking more about using it in a motel room, to work during the evening after plein air workshops...if that makes any sense. I am sure I can live with it, and modify thanks to you! I love the little door stop legs..! You could attach the door stop legs using super magnets. That way they don't have to be on the box all the time. Or, Leave the OBM attached to the tripod and shorten the legs as needed. That's what I do when sitting down. I have researched long enough..Sort of like designing a house, if I got everything I wanted, it would be too big..lol. I just ordered the 12 x 16 OBM and learn from your experience! No need to reinvent the wheel. Thanks for all the help! Anonymous, call Doug (the OBM manufacturer. he is the owner and actually builds the easel himself.) Let him know we had this conversation. You may get your box quicker that way. 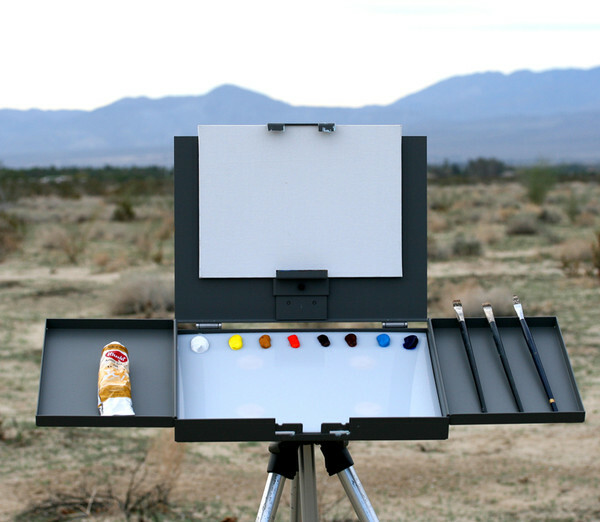 I just heard about a comment about my easel the Coulter Plein Air System, from a new customer. To reply to the comment made by "Anonymous" from what she heard from a professional "Anonymous" painter about my Canvas Panel clips. I started my easel with wider clips in the early 1990's, but because of numerous request and person experience shortened them. The reason was that with the shorter version you have no LIP to have to paint under, your brush strokes can flow right off all 4 edges of your painting. I personally use these 2" wide clips to paint panels over 24" wide with no instability. Because of this one "Anonomous" comment, I am going to bring back the wider horizontal supports as an option. My easel has been on the market since 1998 without one structural malfunction, because of it's simplicity (no moving parts) and durable construction. It is solid as a rock to mix paint on, as opposed to the one point bottom attachment of the pochade boxes. My palette has TWICE the mixing area with LESS WEIGHT because you can mix in the wings. The Standard Size palette is 12x16 times 2. The Standard size Panel Holder also holds a vertical 20" canvas or panel. I think there is a "TACTILE" quality of the feel of the brush on wood, just like the old masters used with their wood thumb held palettes. I use the traditional Baltic Birch that quickly "Cures" with the use of oil paint and becomes slick and hard just like glass. With that said, some of my customers still have glass or plexiglass installed in the main mixing area. My Mini size with a mixing area of 9x12 times two (mixing in the wings) and weighs only 2 lbs without the tripod. It is great for International travel as is the Compact size with the 9 1/2 x 15 mixing area. My easel also sets up in less than 30 seconds. I traveled as a full time RVer for over 10 years, parked up in the mountains and along the ocean. I've painted with my easel in pouring down rain and had to blow the snow off my palette while painting. My priorities for it was FUNCTION and DURABILITY. I believe I have met those requirements and so do hundreds of my customers. Like I stated, I will soon offer the old wider version of the horizontal panel support as an option for some customers. Thank you so much for your very thorough review. I've primarily painted in my studio, from photos, but am also part of a group of painters who take work outside. Ordered a Sienna Plein Air set-up, but was disappointed to find that there was a "wobble" once I started painted on the canvas. It did appear that the wobble came from the attachment of the easel to the tripod (also a Sienna), and I've been debating whether to just send it back. Sounds like from your review that there might be a similar issue with the Strada (which intrigues me for its sleekness and simple functionality). I had initially worried about that hinge in the Strada, but it seems from your comments that the hinge itself is quite sturdy. Is a "wobble" something you just have to live with if you're going to use a pochade box? I don't recommend the Sienna for the reasons you describe. The Strada and the Openbox M wobble the least and are equal to each other in my opinion if you use a quality tripod and tripod head. Read my post on tripods within the past year and you will know what to look for. I was going to pull the trigger on on a pochade set up a few years ago, but other committents delayed my plan. Coming back to this now, what do you think of the Alla Prima Pochade? Reading around the Alla Prima Pochade seems to have a lot of advocates. It appears to use a similar hinged mechanism to the Strada. Is there any extra wiggle in this hinged mechanism compared with the Open M Box? The built in panel storage looks handy, and the fact it doesn't have external metal parts (like the open M Box) could make it easier for sliding in and out of a backpack. Have you seen the Alla Prima in action? Hello Joseph. I haven't used the Alla Prima Pochade myself so I can't really comment on them. But a few of my firends have and they love theirs. The Strada looks well thought out, very utilitarian. Almost too utilitarian. Distant buyers in Europe may take a look and think its just a tin box :) joking aside Im sure it works excellently, and a quality product. Being able to lower the palette of the Open M to a near vertical position for painting "eye level" seems a useful feature. I like the tray idea that you've written about on your blog, seems like a good combo with the Open M set up. The Open M is really appealing with its large mixing area and light weight, but I keep coming back to the convenience of having a built in wet panel storage as found on the Alla Prima Pochade. It seems like a durable option too, and perhaps with the "lite" version doesn't add too much weight. Curious - how do you find the high palette area of the pochade set up when painting "eye level"? Is there a tendency for arm fatigue over long periods of painting? I'm weighing up the pro's and con's of Pochade vs the "Day Tripper" set up. I'm comfortable with the design of the Day Tripper particularly for posture (similar to a studio set up), and its versatility of panel sizes is very appealing. however the pochade set up and experience is unfamiliar to me. On the one hand I like the idea of the pochade palette mixing area being near the actual picture surface for more direct colour comparisons, but I do worry that the posture it requires with raised arm, may cause some fatigue? I have a DayTripper vs Alla Prima yellowstone lite pochade dilemma! Joseph, what I will say here applies to any kind of easel set up, indoors or out. I should probably do a more detailed post on this since how you stand in front of your painting is a concern with many of my students. But before I begin, I prefer to have the mixing area right under my painting whenever possible so that I can see the color next to the painting. But that only works with pochade boxes.